Fly screens can offer a great way to keep your home or business free of flying insects. 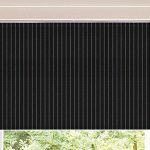 Call Humberside Sunblinds today for a free quote. Fly screens are ideal for keeping out all flying insects, from bees and wasps to mosquitoes and moths. Here at Humberside Blinds, we specialise in the provision of first-rate fly screens, available in a chain design for maximum efficiency. As well as having a practical use, our fly screens can also be a stylish aesthetic addition to any room, and are available in 13 different colours. We always have over 40,000 meters in stock, so are easily able to cater for all needs, and our location in Immingham means we are ideally placed to serve the whole of Grimsby, Cleethorpes and the wider Lincolnshire and Humberside regions. Get in touch today for more information about all of our fly screen products and services, or to discuss any other enquiries with a member of our friendly and helpful team.